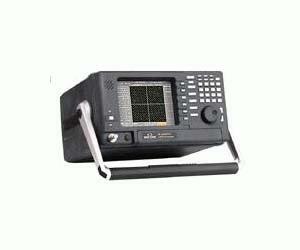 The AT2500RQv 1.5 GHz spectrum analyzer is a high performance, lightweight, battery powered analyzer designed for CATV headend and field portable applications. The AT2500RQv provides the measurement power required for the latest multi-standard 16/64/256 QAM digital technologies, simplifying the worldwide transition from analog to digital testing. With a variety of modular and PC software options, the AT2500R series analyzer can be customized to specific CATV measurement requirements, giving you the flexibility to meet all your broadband test needs. The AT2500RQv is the only analyzer designed specifically for cable TV applications. No other analyzer combines a full featured spectrum analyzer with a full CATV measurement package, time domain measurement module and optional QAM analyzer and video demodulation modules. The AT2500RQv features a 1.5 GHz spectrum analyzer offering both high sensitivity and high scan speeds to ensure that all system impairments can be detected. The spectrum analyzer automatically calibrates itself at regular intervals to make the technician’s job easier and ensure accurate measurements over the entire spectrum in all operating conditions. Internal high/low pass pre-selection filters provide improved dynamic range for measurements in a fully loaded cable system.